The legacy of the Milanese saints stretch half-way around the world, but not surprisingly St Ambrose once again has the last word. 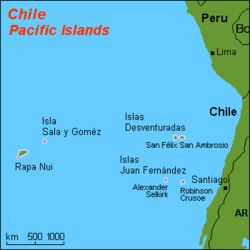 On July 12, 1574, Spanish explorer Juan Fernández discovered a small group of islands in the Pacific Ocean some 850 kms (530 miles) off the coast of Chile. Known as the Desventuradas (or Unfortunate) Islands, Fernández named the two principle islands after the Milanese saints, Felix and Nabor (July 12th), in accordance with the custom among Spanish explorers to name geographical features after the saint or saints whose feast fell on the day of discovery. Four years later in 1579, another Spanish explorer, Pedro Sarmiento de Gamboa (d. 1592), described the islands as ‘small, uninhabited, waterless. They give shelter to many sea birds and seals, and to large quantities of fish’. The islands, which together are less than four square kilometers, are treeless rock formations lying 16 kilometers (10 miles) from one another. According to Sarmiento de Gamboa, the rocky outcrops were called after the saints Felix and ‘Ambor’. Already, Nabor was starting to lose his grip on his island namesake. European maps of America published in 1584, 1587, 1608 and 1640 each refer to the islands as Felix and Nabor. However, a Jesuit priest, Fr Diego de Rosales, observed in a manuscript written sometime between 1660 – 1670 that ‘on the navigation charts drawn in Perú these islands are called the isles of S. Féliz and Ambrosio’, although they are ‘more properly the “isles of S. Féliz and S. Nabor” . . . The error in Ambor and Ambrosio, for S. Nabor, is thus manifest’. The original error in changing Nabor’s name to Ambor does not appear to be an archaic or abbreviated form of Ambrose. However, once the name had been transformed into Ambor, its conversion to Ambrosio was perhaps inevitable. In any case, the original name of the island, St Nabor, which acknowledges its discovery on July 12th, was eclipsed by the end of the seventeenth century in favor of Milan’s most famous saint, Ambrose. The uninhabited Desventuradas Islands still retain the names Féliz and Ambrosio. Two additional small outcrops are respectively named Isolate González (.25 km²) and Roca Catedral (.01 km²). So, halfway around the seventeenth-century world, some 1300 years after their respective deaths, St Nabor was unable to escape the influence of Ambrose’s legacy. And this was not the first time that Nabor, a Roman soldier from present-day Algeria who was martyred together with Felix (c. 304 CE), fell victim to the powers of the Milanese bishop. 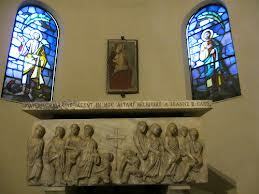 Nabor and Felix were originally Milan’s patron saints before Ambrose supplanted them in 386 with Gervasius and Protasius when he dedicated his new church, the Basilica Martyrum, eventually renamed the Basilica di San’Ambrogio. Today, all five of these saints remain buried in the basilica, giving Nabor plenty of opportunity to take up any unfinished or unfortunate business that he may have with St Ambrose of the Desventuradas Islands. See ‘The Isles of San Felix and San Nabor’ by B. Glanvill Corney in The Geographical Journal 56.3 (1920), pp. 196-200.